This week it was my turn to come up with a challenge for the SALT design team and I chose "Serving for God's Glory", using the above verse for inspiration and meditation. You can read my entire write up on the SALT blog, I'll just make a few brief comments here. In verses 7-11, Peter turns to exhortation on how we are to treat others and reminds his readers to be "serious and watchful in their prayers" and to have "fervent love for one another, for love will cover a multitude of sins." In verse 10 he pens our challenge verse, noted above. As I considered this verse and how I can apply it to my life, I realized that I too frequently have failed to minister to the needs of others around me. I tend to be far too self-absorbed with my own life and struggles and don't stop to look for others in need. It's too easy for my focus to be only on my circumstances and not enough on Christ, the church, and my neighbor. That simple saying, "it is better to give than to receive" is so true. In general, many of us have been abundantly blessed with material things, adequate finances, and generally good health. On top of that, we have Christ, do we need more? Yet there are so many who are in desperate need, either of practical help, a word of encouragement, a listening ear, or genuine love and friendship and we (at least I) have a tendency to pass them by. May God be pleased, and may we be willing, to use us to minister to those around us... not so we can pat ourselves on the back or enjoy the good feelings that come from helping someone but so that God can be glorified as we faithfully use the special gifts He has given to us. Onto the project! When I went to create something for this week's challenge, I wanted to make an altered notebook to jot down notes about those who I think could use a phone call, a note of encouragement, or some practical help. (I plan to start with the folks in my own church!) And me without a list is like a dog without a bone...I need a list to stay organized! 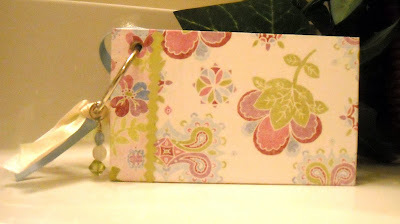 I remembered this handmade note card holder that I picked up at a craft show a few years ago. It's been sitting in my desk, collecting dust ever since, even though I think it's an adorable project. It consists of a chipboard front and back and has a boatload of 3x5 index cards in between. The entire piece is held together with a metal ring. The picture of the original piece is below. It was cute "as is" but not really my color scheme or style so I decided to change things up a bit! I recovered the front and back covers with these beautiful Bo Bunny papers, from Wholly Scrap, and then proceeded to embellish the front. I started with a chipboard frame that I covered with more Bo Bunny paper. To that I added another piece of swirl chipboard that I colored brown with a dye ink pad, the swirl is meant to represent a tree branch. 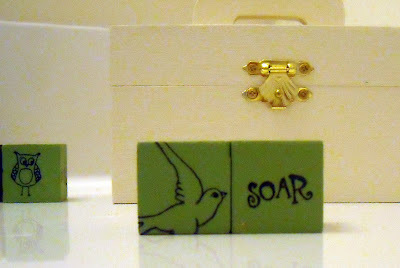 Next came my wee little bird, from an Impression Obsession stamp set, also purchased from Wholly Scrap. A few teeny felt flowers, from Papertreyink and colored with Copics, were a fun addition to the branch, as well as tiny rhinestones from Taylored Expressions for the bird's eye and middle of each flower. I created the "serve" piece by stamping an alphabet stamp, cutting out the individual letters, and then piecing the word together. I really like the way the paper overlaps with each letter. Another chipboard heart, colored red, finished off the front. All I needed were a few ribbons to attach to the ring! I'm happy with the final piece and am looking forward to making some notes this week. The notebook is even small enough to fit in my purse so it's a perfect take along and it would be a piece of cake to recreate so why not give it a try!! And while you're at it, the SALT team would love to see your artwork, created based on this week's theme. Just leave us a comment with a link back to your blog or gallery and we'll come visit! I also wanted to mention that the SALT team blog and my blog will be participating in the A Faith Perspective blog hop on November 14, 2009. The theme of the hop is "Thankful for Friends of Faith." Please stop by on the 14th for a list of participants and challenges! 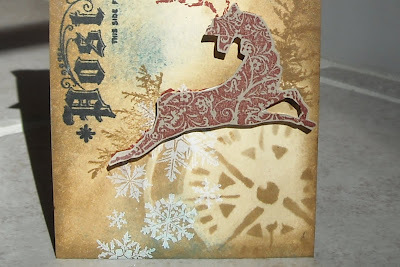 One more tag to share from my recent stamping weekend with a dear stamping friend of mine....This one is all Tim! In the lower right hand corner, shown close up below, you can see the compass mask that was used to create the stencil....isn't that so cool? 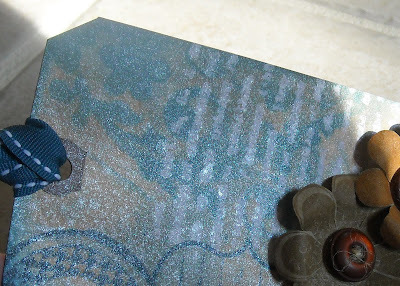 I then used Ranger distress inks to age the age and add small spots of blue. 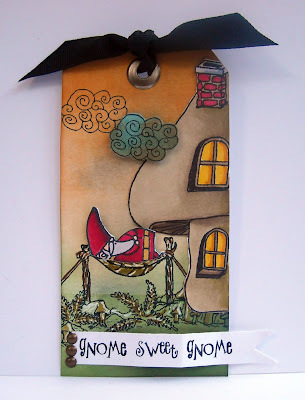 All of the images used on the tag are also from Tim Holtz line. These stamps are unmounted rubber, on a foam back. Love the images and the stamp quality. A clean image was easy to achieve and the stamps come with a nice cling sheet for easy storage. 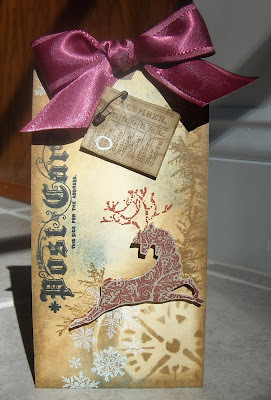 I stamped the reindeer twice, once on the tag and once on kraft cardstock. The kraft reindeer was cut out and attached to the tag with dimensional tape. 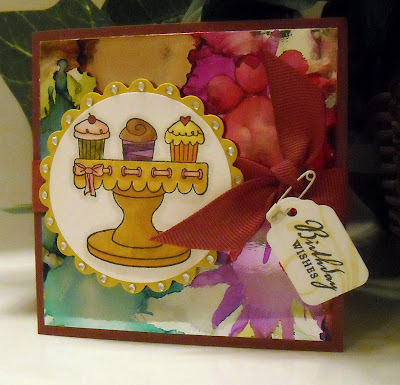 I finished off the piece by adding a the small calendar image, attached with an antique pin, and a big 'ol bow, courtesy of Stampin' Up! Enjoy! super funky custom patterned paper. These blocks are very small, about an inch and a half square. I picked up a bag of them at my local super craft store and they only required two coats of acrylic paint to finish them. (I didn't know Julie was having a boy or I would have gone for a blue theme!) 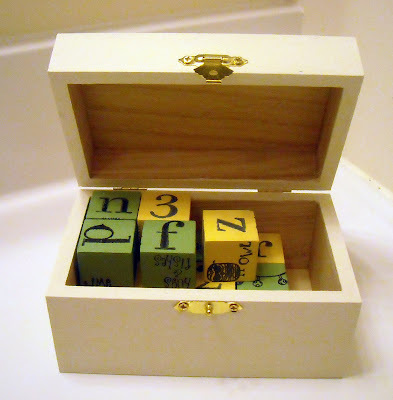 Once the blocks were dry, I used Memento ink to stamp the images on each side of each block. All of the images used are from Odd Bird Planet. One of the fun things about these blocks is that you can match up sentiments and images. 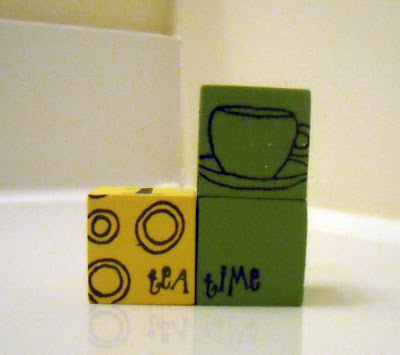 Here is the "tea time" sentiment separated onto two blocks and matched up with the tea cup. In the image above, there "cupcake pirate" and "'lil pumpkin." I am quite convinced that OBP stamps are the absolute perfect stamp for this kind of project...far too much fun finding all of the matches! And the owls and gnomes...oh, just stop me...they too cute!! The only slight downside is that the baby can't play with these until he promises not to eat the blocks as a snack. I'm pretty sure acrylic paint isn't healthy for growing babies! I guess this will leave Julie, and the other Masse kiddies, with the task of making all the matches for awhile... :-) Enjoy! Guess what? Julie had her baby! (OK, this is almost old news since he's a whole week old now) but this is a first peek at the card I made for her and sweet baby Owen. (Is it sad that we make cards for our friends and post them on our blog??! Just wait, I'll be posting pictures of one of the gifts later this week...LOL! Nothing is a secret Jules!) Anyway...As usual, I waited to the last possible moment to make a card for Julie (my sister-in-law got married a month ago and I still haven't sent a card...how is it possible that I'm a card lady that never sends cards?? Egads!) so I needed a fast and easy card! I decided to go with a tried and true layout of using the four squares of patterned paper in the middle of a card, this is a 5x5" card and the amazing papers are from October Afternoon. I then went on an image search and found this adorable bunny among my giant pile of images from a swap I participated in a few months ago. Isn't he so darn cute? He was colored with Copics before adding the sentiment, from Papertreyink. 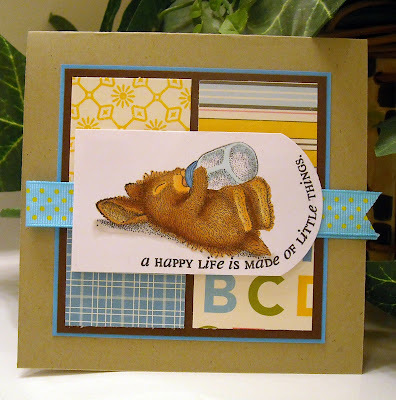 And since acrylic stamps bend to fit any shape, I was able to bend the sentiment around the edge of the bunny image. Since the image had been sent to me on a pre-cut piece of cardstock, I was somewhat limited in what I could do with the bunny image. The paper was too narrow for a circle or square punch so I decided to simply cut off one end of my bunny with a circle Nestibilities. (I inserted only the right side of my paper into the die, leaving the left side resting over the top of the die before running it through a Cuttlebug) The ribbon was simply layered under the image, which was attached with dimensional tape. And I actually think this ribbon is left over from a project I worked on with Julie...or it's something she gave me...how fun is that!? If you haven't seen Julie's news...hop on over to her blog and offer her a big congratulations! I, for one, am darn happy that I'll get to have some newborn snuggle time...without having to endure nine months of pregnancy or any hours of labor...It just doesn't get any better than that! Notice the quart size Ziploc bag filled with toothpase, etc. and the lunch boxes? 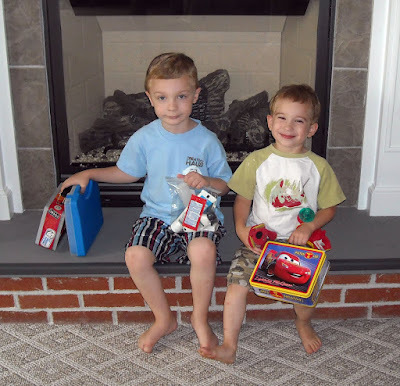 When I was headed out to CHA, the boys decided they were going to "pack their bags" as well and come along! Ali Edwards had a neat post today that I thought I'd copy...It is based upon inspriation from The Simple Women's Day Book. Outside my window...A blanket of pine needles and seven hundred million acorns and pine cones. I am thinking...about what 2010 will bring and how in the world I'm ever going to find time to decorate our new house. Hey...I unpacked the clothes... I am thankful for...my children and my husband. It's too easy to get bogged down in the every day details and chaos involved in running a household and a business but I am so thankful that God has blessed me with a loving husband and two dear children and I need to remember that each and every moment of every day. From the kitchen...Lately, it's been filled with Rice Krispie treats...They're evil I tell you, pure evil...but I can't stay away from them...I might even steal them from my children's hands if they're not paying attention... I am wearing...Jeans, that are finally looser after dropping a few pounds, and a big comfty sweater because it's getting far too old outside! 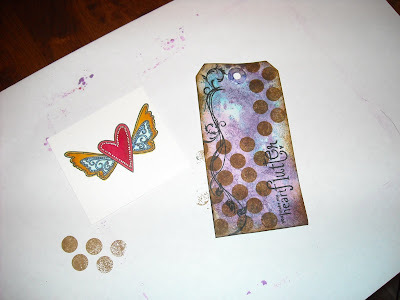 I am creating...my class supplies for a stamping class I'm teaching at Wholly Scrap tomorrow! I am going...to the scrapbook store in a few minutes - yippee! I am reading...Feelings and Faith by Brian S. Borgman, a book that weaves together biblical exposition and practical application to demonstrate how emotions relate to the Christian life. I am hoping...that I can learn from recent mistakes . 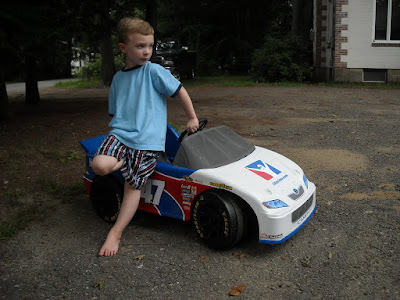 I am hearing...my boys arguing over who has what cars. Good thing Grammie is with them! One of my favorite things...watching my children sleep and spending quality alone with my hubby. A picture to share...I love how handsome and mature my boy looks here. This was a completely unposed shot. Enjoy your weekend! And why not play along with these questions for today...This exercise would make for a great scrapbook page too! This is one of the verses that Hazel shared on the SALT blog supporting her challenge for this week - confidence in God. A thought provoking verse that can bring much comfort to those who are facing difficult circumstances in their lives or who are prone to anxiety over certain situations. Hazel shared many other excellent verses and comments on the blog, I encourage you to read her thoughts on this week's challenge. When searching for a Scripture text for me to use on my ATC, this one from Verve was a perfect fit. Such a powerful statement for believers to "be still..." God is still on the throne, no matter how things may appear on this earth. Matthew Henry, in this commentary, had this to say about Psalm 46, "This psalm encourages us to hope and trust in God, and His power, and providence, and gracious presence with His church in the worst of times, and directs us to give Him the glory for what He has done for us and what He will do. We are here taught to take comfort in God when things look very black and threatening, to mention, to His praise, the great things he has wrought for His church against its enemies, to assure ourselves that God who has glorified His own name will glorify it yet again, and to comfort ourselves with that. We may, in singing it, apply it either to our spiritual enemies, and be more than conquerors over them, or to the public enemies of Christ's kingdom in the world and their threatening insults, endeavouring to preserve a holy security and serenity of mind when they seem most formidable. It is said of Luther that, when he heard any discouraging news, would say, "Come, let us sing the forth-sixth psalm." Here's my second card that I completed for one of the WCMD SCS challenges, which was to create a thank you card, follow a certain layout, and use the color brown. This is the first time I've inked up this amazing floral image from Papertreyink. I kept eyeing this set while we were at the CHA Super Craft Show but decided I had enough floral images and left the show without it. But...I just couldn't not get it!! And I don't any regrets about adding another flower to the collection! The image was stamped, colored with Copics and cut out before being mounted with dimensional tape onto my cardbase. 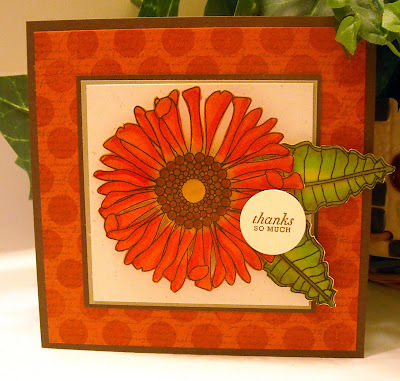 The orange layer was also stamped with two Papertreyink sets, Polka Dot Basics II and Text Style. Enjoy! Greetings all! Tonight's post is going to be a quick one...It's 10pm and I just got home and into my PJ's after seeing Julie's new, sweet, smoochie, wonderful baby boy!! Check out her blog, she has a picture posted. It was hard to leave the hospital since I was so cozy and sleepy snuggling with baby Owen. Ah...I just adore the "fresh out of the oven" stage! 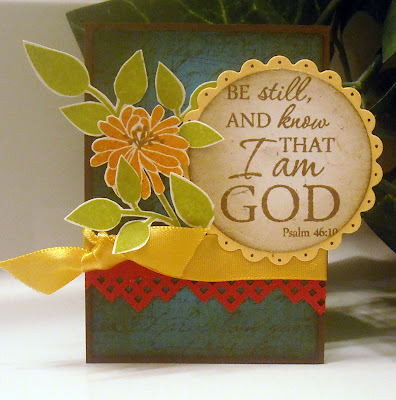 :-) This is another card that was published in last month's Scrapbook News and Review online magazine (the Cards and Stamping section), using Our Daily Bread stamps. This was a super easy card; I only used patterned paper (isn't that orange star paper fun?) and three large grommets to add a little drama to the kraft cardstock. This was one of my favorite cards using this set and the layout is one I'll need to keep in my back pocket to use again in the future! That's it for me tonight...I'm off for a snack...I'm starving!! Enjoy! Why hello Wednesday, when did you get here? Someone slow down the clock...I can't believe the week is half over or that it's been almost three days since I last posted on my blog! I simply need more than 24 hours in each day... 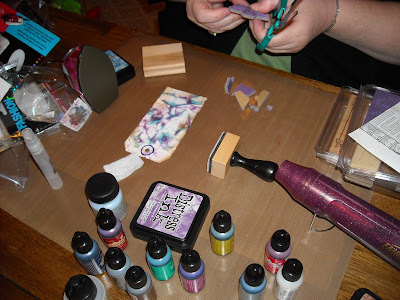 So...a few weeks ago a friend of mine came over for a visit and she brought with her a big 'ol bag of Ranger goodies and some Tim Holtz tips and techniques. And did I ever have a great time! We worked with distress inks, crackle medium, rock candle stickles, embossing plates and paste, glitter...let's just say we went hog wild! In the above photo my friend is demonstrating a way to add ink to a tag. Using a craft sheet, which is one of the most amazing things ever...you can put ink on it, use your heat gun on it, it's indestructible! Go to eclectic Paperie and buy one right now! OK, commercial over...Using the craft sheet, apply ink directly on to the sheet. Spritz the craft sheet with water until the ink has beaded (you can see that in the photo). Then slap a tag right down on the wet ink and smoosh (that's a technical term) it all around. 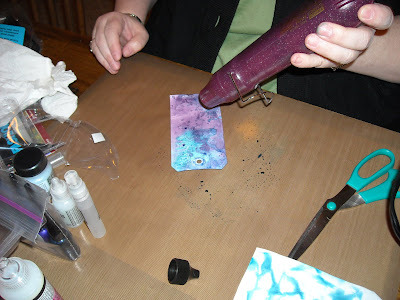 Use a heat gun to set and then add more ink, if desired. The finished result is aged and vintage...fabulous! Here's my tag in progress with the ink applied as well as a few other images from Unity and Papertryink. Isn't that fantastic!! This is another technique we tried where we crinkled up the tag and then used distress ink to drag the page across the tag for aging. (I have yet to finish my tag with this technique!) We also played with some inks and glossy paper...I need to make something with the paper we created. My kids even got in on the act and created their own tags. Great fun! 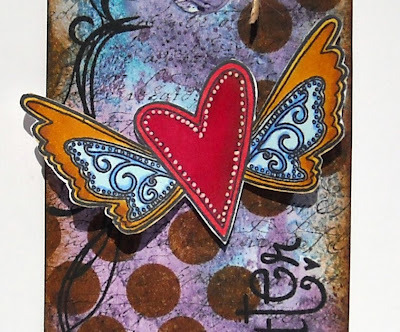 Finally, here's a close up on my tag, where you can see the detail on the heart image (isn't that such a Tim Holtz type of image...Love it! It's from Unity's KOTM). 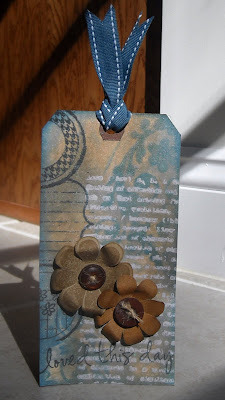 You can also see the layers of images on the tags...all my favorite things; words, swirls, polka dots, and lots of aged edges! WooHoo!! We're already planning our next crafting playdate...I can't wait...maybe we'll do videos next time around...I should also mention that you can purchase all of your Tim Holtz and Ranger products at eclectic Paperie! Enjoy! Thanks to a heavy, all day downpour yesterday I was able to actually participate in a few World Card Making Day challenge...yeah! This is the first time I've ever had the time to actually make cards for this fun event! 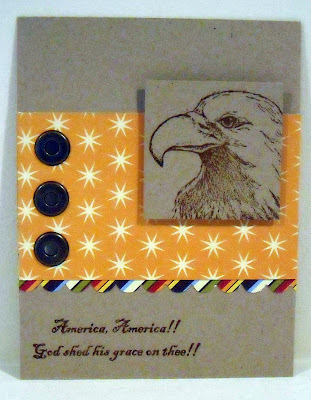 I focused on challenges posted on Splitcoast Stampers, even though I wish I could have participated in them all! This card is for the Unity challenge, which was the first one of the day. The challenge was to use a quote as the focal point on our cards. Since my Unity KOTM stamps have been far too neglected, I knew it was high time for them to get dusted off and inked up! 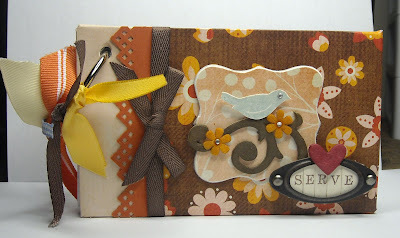 I loved this bird image and knew it would be perfect for a....drum roll, please....Michelle Zindorf inspired card! Anyone weary of my MZ cards yet? :-) Not me...I just adore this style and it is far too much fun to create...I am a mess by the time I'm finished with one of these cards, my hands are covered in ink and I've got sponges and ink pads all over the place. I love it! This card is meant to look a bit like a tree branch over water (I say that because my husband didn't have a clue...hee hee) The moon was added with the negative space of a circle punch and white ink. I also added some text and swirls on the right side of my card for a little extra visual interest. :-) You can also click on the photo for a larger view. Oh, and the card size...isn't this fun, it's 4x8". Well folks I am off to relax for the evening...all that stamping yesterday wore me out! LOL! Enjoy! 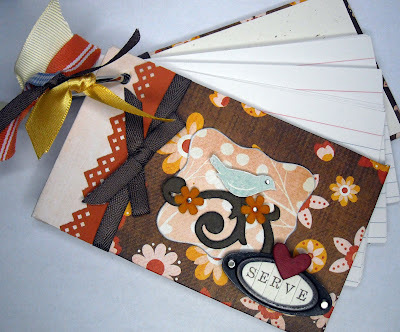 Welcome to the Odd Bird Planet World Card Making Day blog hop!! 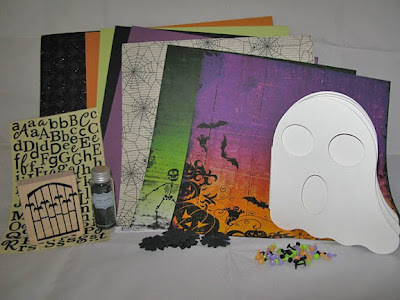 An awesome A La Tarte Halloween kit, which contains cardstock, patterned paper, embellishments, a chipboard book, and the OBP Bat Gate stamp!! (International participants can win a $50 Gift Certificate to the OBP Store.) Here's a list of what's included in the kit: Pattern Paper: Bo Bunny Friends Bo Bunny Haunted Making Memories Dot Black Making Memories Dot Stripe Embellishments: Doodlebug Sugared Brads Bazzill Black Prima Flowers Beetle Black Sugared Glitter Black Cheeky Alphabet Stickers Other: Ghost book Cardstock: Bazzill cardstock - 1 each of Marigold, Raven, Jubilee, and Limeade Stamp: Bat Gate by Odd Bird Planet You should have arrived here from Karrie's blog and after visiting here, hop on over to Laura's blog. Here is the entire list of those on the blog hop: Godelieve Dianne Karrie Kim Laura Marnie Teresa Tiffany Tracy You can also share chatter and your completed projects at Odd Bird Planeteer's Flickr Group. Thanks for playing along and enjoy this special day set aside for card makers all over the world!